Kefalonia, the largest Ionian Island lies across the narrow sea from Ithaka. Starting at the North end of the Island a jagged mountain spine runs South to the highest mountain of the Ionian - Mount Nero. From the East side, beautiful pine forests run down to the seamostly made of local fir trees. Sunday: Aghia Eufimia, Kefalonia – Fly UK to Kefalonia and transfer to Eufimia harbour for embarkation. The base in Eufimia is a perfect point from which to explore the southern Ionian islands. Monday: Vathi (17nm) - Vathi is the largest town on the island, and is situated at the head of the well-protected bay. Explore the back streets for some great tavernas and nightlife. Tuesday: Fiskardo, Kefalonia (11 nm) – lively and sophisticated but retaining some traditional Greek charm and character, a great place for people watching. 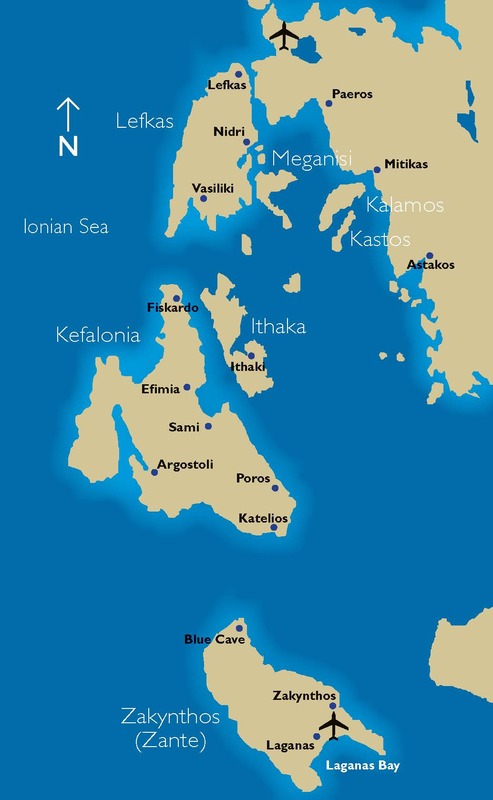 Wednesday: Assos(10 nm) – We sail around the north coast of the island, heading for the village of Assos, with the famous fort occupying the penninsula. Thursday : Poli Bay (13nm) – Beach party today, and we head south to the west coast of Ithaca, and Poli Bay – perfect for a flotilla raft and a party on the beach. Friday: Free Sailing - Plenty of choice - head south to Zakynthos, or alternatively head east to Ithaca, your lead crew will be happy to make some recommedations. Saturday: Aghia Eufimia - Return to our base and enjoy a "last supper" together on the waters edge. Sunday: Aghia Eufimia, Kefalonia – Fly UK to Kefallonia and transfer to Eufimia harbour for embarkation. Our home in Eufimia is a perfect point from which to explore the southern Ionian islands. Monday: Poros, Kefalonia (14 nm) – Enjoy a great sail down the channel between Kefalonia and Ithaca. Our destination today is Poros, which contrasts with Fiskardho and offers a more traditional take on Greek coastal life. Tuesday: Zante (23nm) - Time to cross the straight between Kefalonia and Zakynthos, and head to the capital of the island, well worth exploring as the sun sets. Wednesday : Aghios Nikolaos, Zakynthos(13 nm) – South we go again, heading across the strait to Zante, one of the most popular Greek islands. From Aghios Nikolaos, a high speed boat trip is possible to "Shipwreck bay", regarded as one of the best beaches in the world. Note: If weather conditions are not favourable, we substitute this stop for a beach BBQ and party in a secluded bay. Thursday: Sami, (28 nm) – Sami is our destination today, heading back up to Kefalonia. The well protected harbour is right in the town, and some excellent fish tavernas beckon. Friday: Free Sailing - Plenty of choices for your free sailing - ferent - your flotilla crew will be happy to make the best suggestions for your party. Saturday: Aghia Eufimia - Return to the base on Kefalonia island and enjoy a "last supper" together. Flight inclusive packages are available through Sunscape Yachting with direct flights to Kefalonia Airport departing on Sundays from Gatwick, Manchester, Birmingham, Bristol and Stansted.